New Frontiers at the LINC, ITB. Sustainable, international technologies are at the heart of 12 new start-up businesses graduating from Phase Two of Enterprise Ireland’s New Frontiers Programme at The LINC based at the Institute of Technology Blanchardstown, who collectively have confirmed the appointment of 60 new Irish jobs within the next 12 months. LINC salutes another class of smart business and technical entrepreneurs who have accomplished the six-month Intensive Business Accelerator Course and will now set about independently to raise capital investment, grow their businesses, and between them, create employment for 60 aspiring employees keen to work in one of Ireland’s newest, innovative start-ups. WellClik.com founder Darryl Gibney, from Navan, Meath, is one of THE 12 New Frontiers graduates from nine counties in Ireland, as well as one international participant from Spain. Ms. Gibney has created a business which aims to reduce time, money and resources in the Practitioner sector, through a software that automates administrative tasks, whilst providing a front-facing on-demand booking engine for clients. The company is currently recruiting for Sales Consultants and PHP Developers. As one class graduates, the LINC is calling upon a new wave of entrepreneurs to apply for the 2017 New Frontiers Programme. Potential participants can benefit from mentoring, practical access to research and knowledge centres within the IT college and all within close proximity to major industrial and commercial hubs, giving them a competitive edge and a fantastic location to grow their start-up business. We are delighted to have guided these entrepreneurs through their start-up journey over the past six months. The LINC (Learning and Innovation Centre) at IT Blanchardstown has become a real magnet for top entrepreneurial talent in the capital and we harness and develop this talent through our partnership with Enterprise Ireland to deliver programmes such as New Frontiers,” said Learning and Innovation Centre Manager, Claire Mac Namee. 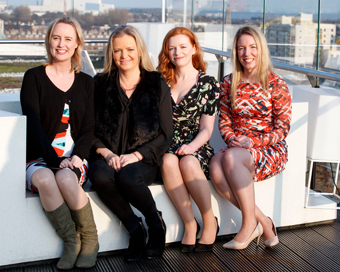 Pictured: Sarah Fleming, Beauty Entrepreneur from Dublin, Susan Kealy, Career Craft, Grainne Fenton, Technology Entrepreneur from Kerry, Darryl Gibney, Wellclik. Picture Andres Poveda.